Postcards are simple, compact, affordable and highly effective means of reaching people. There is no doubt that postcard printing is a great and cost-effective marketing tool that can get your message across to people in a unique way. Whether you are announcing your wedding date or promoting your business, short-run postcard printing makes sense. With our postcards, achieving real growth in your business and making huge ROI is easy. Our premium 14pt card-stock comes standard, and we can print it in full-color on both sides. If you are looking for one of the most efficient and affordable marketing tool, look no further than postcard printing Las Vegas. We also provide mailing service as well. We have five different sizes of postcards you can use to market your product and services effectively. The available sizes include 4"x6", 4.25"x5.5", 5.5"x8.5", 6"x9", and 8.5"x11" – each mail at the lowest postage rate. You can upload your postcard image file on our website with ease, and it’ll be printed within two to four days. The reason many companies love Sunrise Printing for their postcard printing needs is that we print high-quality postcards at the most affordable rate. 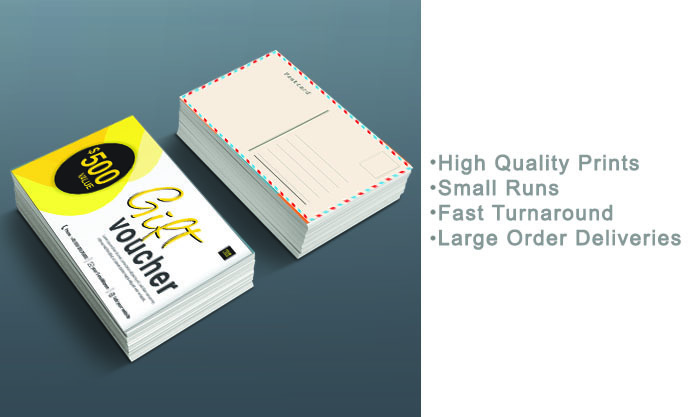 Check out our postcard printing rates or call us for a custom quote now.